Adorable Hummel style figurines. 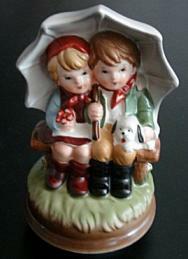 Children under umbrella in porcelain bisque, 7.5" high, revolve to "Raindrops Keep Falling on My Head." Special purchase of new old stock Vintage music boxes.